Canceled – Sorry everyone… Registration numbers were nowhere near where they needed to be for this event. Apologies to the folks who were really looking forward to it. We can think if a different date would be better or if the scenario concept isn’t going to draw enough solid interest. Thanks and again… our apologies. It is a decade after the Treaty of Coruscant ended the Great Galactic War between the Sith Empire and the Galactic Republic. Throughout the Outer Rim, border skirmishes and proxy wars erupt sporadically to threaten the uneasy truce. 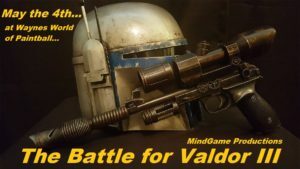 Valdor III stands to become the newest battleground in this galactic Cold War. An independent, forest world in the Outer Rim, Valdor III was colonized over 400 years earlier by humans from the core worlds, and has seen migrations from other sentient races. Ancient ruins from an extinct indigenous population remain in the deep forests and ancient Valdorian relics command a high price. A lightly populated planet, the government has long had difficulty enforcing the rule of law outside major cities and Valdor III has developed a bit of a reputation as a haven for smugglers and even less savory types that the authorities largely ignore provided they don’t interfere with affairs of state and don’t cause problems with the general population. The planet was a constitutional monarchy for centuries, by a dwindling royal bloodline. The last regent, Jarl Arithos, died without an heir two years ago, and a duumvirate was established by the Houses of Bolyn and Panteer. Within a year, cracks were already showing in this ruling alliance by the two Houses, and the situation steadily declined. Each House has accused the other of plotting to seize power. Both have been exposed coordinating with criminal gangs to secretly smuggle weapons from off-world and each have taken to hiring mercenaries to bolster their ranks. A civil war is looming on the horizon. Into this growing storm have arrived representatives from both the Sith Empire and the Republic, Dark Adepts and Jedi Knights. They are here to negotiate with the two Houses and ensure that the victor commits to neutrality at worst… or allegiance at best… but few carry illusions they are against direct action to further their aims. House Bolyn and House Panteer are expected to play with the delegates and seek the best deal they can secure, but they must realize that delaying too long will let their opponent seize the high ground. Smugglers and criminal gangs on Valdor are worried that a regime change, especially a formal alliance with either the Republic or the Sith Empire, will result in a future crackdown on their illicit activities. They have been taking advantage of the growing troubles by running weapons and supplies to both Houses, but they fear outside influence on the Valdorian government. They are expected to be working to secure a commitment of a laissez-faire approach to “independent business” on Valdor and may actively work to sabotage the off-world delegates or threaten to withdraw their illicit support for any House which strikes an alliance. Join us on May the 4th for our first airsoft experience set in the Star Wars Universe. Choose your identity and take a side in the Battle for Valdor III! It’s also time to fill out new waivers! Help us with our effort to establish an online waiver library and complete all three today if you have not already! These will be valid for MGP events at Waynes World of Paintball from March 1, 2019 through March 1, 2020! All three must be completed and confirmed via email. It’ll just take a few minutes and you’ll be good for the year!